Spring is here and it's time to grill! 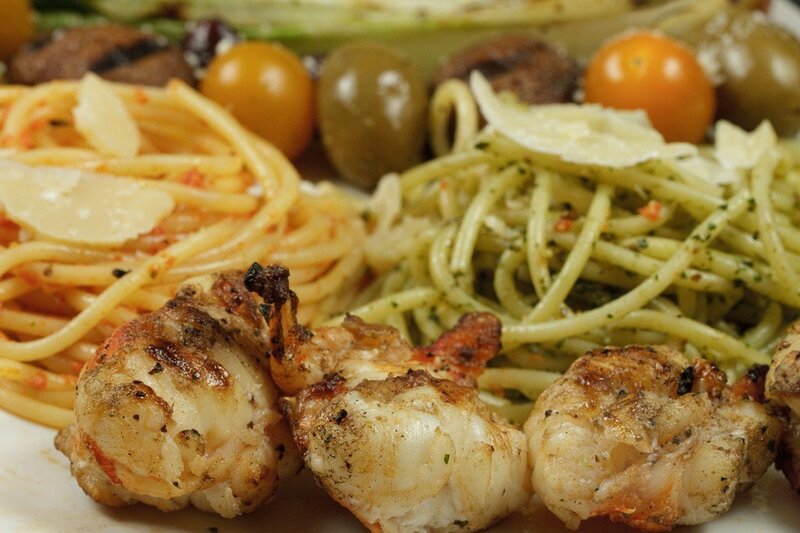 Lobster, grilled romaine, and pasta with traditional pesto Genovese and a sun-dried tomato pesto will bring smiles to your table. What speaks spring to you besides grilling? For me, it’s fresh light pasta dishes and what better than garden fresh basil for a beautiful green pesto. Since we’re talking about pesto I thought I’d also make my favorite pesto, with sun-dried tomatoes. While we do associate the word pesto with the original variety that uses basil, over the years, many different versions have surfaced. Really any fresh and fragrant leafed herb or green will make a wonderful pesto. 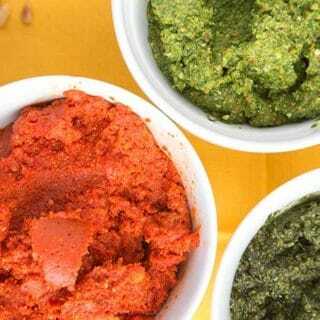 The original recipe for pesto contained pine nuts, with almonds being used in different types of pesto. I’ve also seen walnuts substituted for pine nuts, and of course, if you’re allergic, just make the pesto without any nuts at all, or try my version using roasted chic peas instead of nuts. But no matter what you make your pesto with, just toss it with your just cooked pasta, add a drizzle of good olive oil and a sprinkle of Romano Cheese and you have the perfect pasta, fresh, light and full of flavor! If I’m grilling and there’s romaine in the house, you can almost count on the grilled romaine salad, since our discovery of it a few years ago, it’s been a staple at our dinner table during grilling season. Just cut the romaine head fully in half, leaving the core intact, drizzle the inside with olive oil, sea salt and pepper and place it on the grill until it gets just a little bit of color. If you really want to spice things up, warm up your favorite Caesar dressing, you won’t believe what a little heat will do to the flavors of a good Caesar dressing (avoid the mayonnaise varieties). 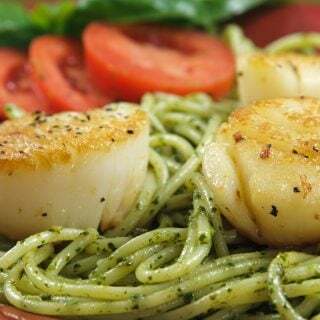 You might also like my recipe for Pan Seared Scallops with Linguine Pesto. To toast your pine nuts get a pan sauté pan very hot , then turn off the heat, and add your pine nuts. Keep the pine nuts moving around so they toast without burning. Place them into your food processor, Pulse it until its minced very well. and Voila you got pesto!! 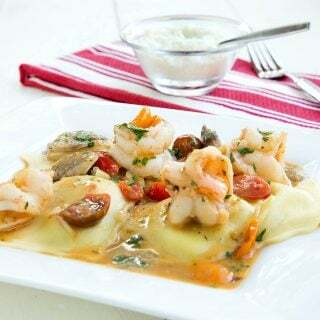 To make this version, just eliminate the basil and parsely from the frist step and replace it with the sun dried tomatoes, after that just follow the remainder of the recipe. For a change of pace substitute other herbs for the basil, such as cilantro, mint, or even use bitter greens such as arugula, beet greens, or kale. Any green you can pulse and get to the same consistency will work. Pesto can be frozen, try freezing it in ice cube trays, then removing the cubes and storing in a ziplock bag. The pesto will stay fresher and you can just defrost as much as you need. 1) I am so glad I am not the only one that said March went out like a lion. My boyfriend did not understand what I was saying at all and thought I was nuts. 2) I have yet to tried grilled romaine and I am sad that I have not gone full swing again into grilling yet. I am still trying to scratch things off the cold weather list. I think our shorter than average winter messed with my hearty meal schedule. 3) I did not know true love until I made my first pesto. My attempts have been flavorful but simple. I love the addition of the sun dried tomato and can’t imagine how much more that adds to this great sauce. This dish looks amazing! I love pesto too. Great recipe! We love pesto in our house – it’s my go-to for a quick and easy dinner. Sun dried tomato pesto is one of my kids’ favorites. I made this for dinner tonight with the Sun-Dried Pesto (I mixed the Romano with Parmigiano). I love, love grilled romaine with a very light citrus vinaigrette. I used angel hair pasta, and my husband grilled the lobster tails to perfection. Thank you so much for a lovely dinner (suggestion). Thank you so much for letting me know you had a great dinner! 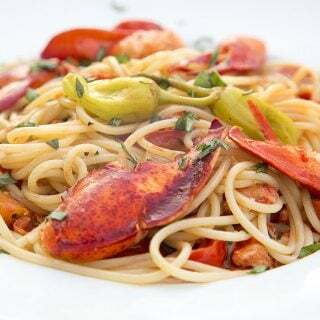 I do love a good sun dried pesto, and who doesn’t like lobster! Hi sweet man. I’ve missed you! I’ve been pretty overwhelmed with life lately, but I’m doing better…and I’m happy to see all these lovely recipes I need to catch up on here! I’m afraid to grill romaine (silly, I know) but I will give this recipe a try! What a wonderful end to a long Thursday at work. I hope you have an amazing weekend, my friend. Hi Dennis! Your recipe looks amazing. I remember stumbling upon your blog a few years ago after you left a comment on my blog recipe for bruschetta topping (June 2010). 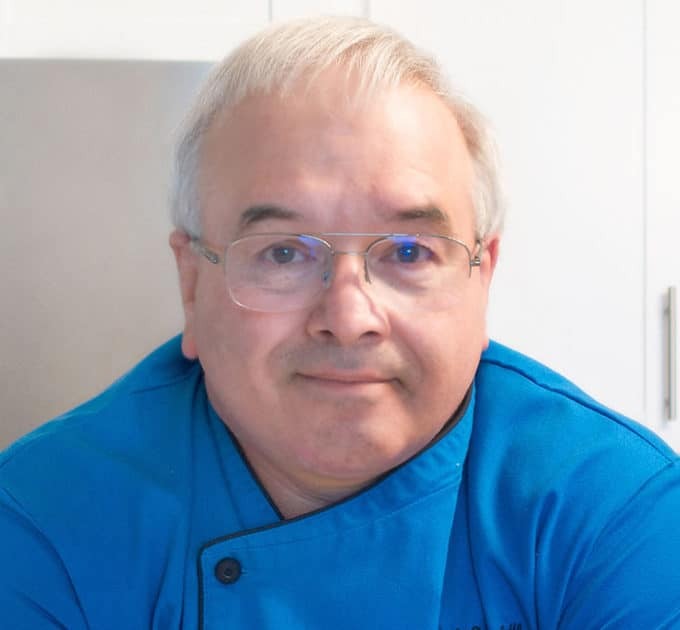 I was so honored an actual chef had commented on my blog! I recently joined Food Buzz and noticed your recipes appear quite frequently. I look forward to more posts. Thanks Dennis! its so nice to hear from you, I hope all is well in your world. Glad to hear you joined Foodbuzz, it is a wonderful community. 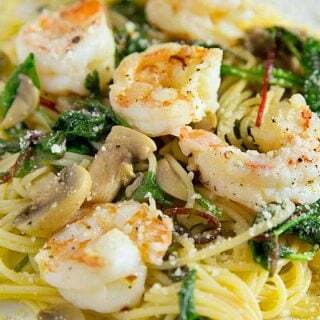 This looks amazing, I never think to use grilled seafood in pasta, just eat it. Great tip on grilling romaine I’ll have to try that. We have been having steady beautiful weather here in Florida…low 80’s since Feb, and not much rain. I usually wait to grill in the winter when we can open up the house and enjoy the lanai. Dennis, congratulations on being #1 in the Top 9! 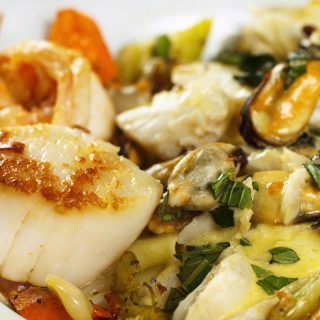 This dish looks incredible and I may just have to make it even though I have an aversion to seafood! I just posted yesterday about pesto. I’m going to have to try putting the parsley in it as you suggest because it did have a pretty good “kick” to it. Thanks! This looks amazing! YUM!! When’s lunch?? 🙂 thanks for sharing!! Everything on the plate looks fantastic, Chef Dennis! I have yet to try grilled romaine, but it is going to happen soon. I’ve just recently been exposed to grilled romaine at the restaurant I work at and it’s mind-blowingly good! Can’t believe I haven’t had it before =) This whole meal sounds incredible Dennis! I love grilling just about everything! And pesto is a big winner in my book.. this is a fabulous post! That lobster is just calling out to me… thanks for a great post! You had me with the word pesto, Dennis. I am a sad portrait of a Basil addict. My body is telling me to warm up…normally the cold doesn’t bother me much but since it never really got cold it doesn’t know how to act now. I would pay for this dinner right now. I love lobster and this looks so decadent. Lovely! I am a huge pesto fan, and I have never thought to use chickpeas in place of nuts! Great idea! Also love the grilled romaine. Brilliant! My lord this is a beautiful meal. And very creative, I love every ingredient you used! Pesto is one of my favorites for sure. So easy and it can go with so many different things. Thanks for sharing chef! I’m so happy grilling is back! I’ll have to add this to my to-do grilling list, it looks fantastic! This sounds amazing! I love the sun dried tomato pesto!! Beautiful, Dennis. I never think to mix the parsley and basil in my pesto – but thank you for the reminder (and the sundried tomato pesto). The grilled romaine totally makes me long for grilling days…I hope those days are here soon. Wonderful dish! It looks perfect for a romantic evening on the patio. I especially love the sun dried tomato pest. Hope you are enjoying your week! 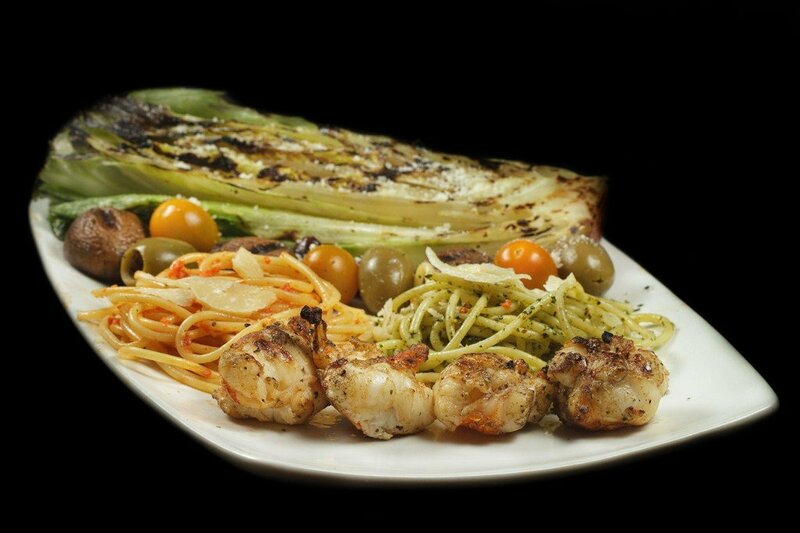 Chef Dennis…I have never grilled romaine before…mmmm that is great idea 🙂 and that grilled lobster looks succulent especially you zoom it so near for us to drool :p thanks for the pesto recipe and I think Mama Jeanette did it right by adding italian parsley to the basil to tone down the intensity of the basil and at the same time kept the color vibrant. I imagine how delicious this meal would be. I love everything on that plate ! Great tip about the romaine Chef. The grill brings out such a different flavor and is also nice with some blue cheese and crumbled bacon.